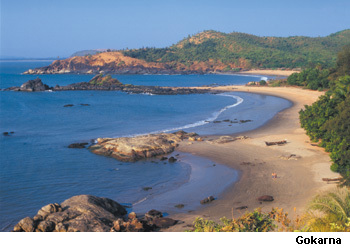 Gokarna is the enchanting city of beaches. Haripriya Residency in Gokarna is Stone's throw from the KSRTC Bus Stand and walking distance from all the Temples and the main Beach, Om Beach and other Tourist attractions are very near by. The Railway Station is just 9 Kms away. 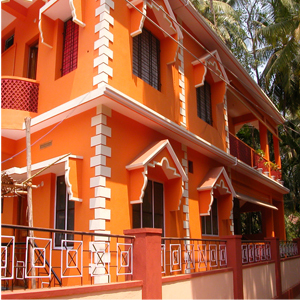 We rate it amongst the most convinently located, affordable and popular hotels in Gokarna. Gokarna is about 200km north of Mangalore (7 hr by bus) and 56km southwest of Karwar on the seashore. According to the Gokarna Purana, “By mere entrance into this Ksetra (holy place), one becomes liberated from hundreds of sins, including even brahma-hatya (the killing of a Brahmin).” Moreover, it is said that one becomes free from rebirth by just looking at the Atma-linga, by hearing the roar of the sea, or by taking birth in Koti-tirtha. Shaped like the Hindu spiritual symbol of Om, this is the most famous beach in Gokarna, and has got the best waves and beach-side shacks. It's a wonderful stay in any of these shacks, called cafes. Expect thatch hut rooms and common bathrooms in most of them. Though some of the cafes have rooms with attached bathrooms.It takes around 20 minutes to reach this beach from Gokarna bus stand.